Glo-Crest Dairy, owned by Mr. Scott Glover and Dr. Jennifer Glover, is located in the beautiful, rolling hills near Clermont, Georgia—less than an hour north of Atlanta. They share the farm and lovely homestead with their daughter Eliza Jane. Scott, a fourth generation dairy farmer, had his first taste of dairying working alongside his grandfather while he was still in school. After working with his Uncle Steve Crumley for several years, Scott ventured into the dairy business for himself in 2000. He formed Glo-Crest Dairy with his wife Jennifer. She’s also an Assistant Principal in elementary education, but works along side Scott at the dairy during nights and weekends. Together, Scott and Jennifer milk 65 Holsteins 2x in a double six herringbone. The cows live in a freestall barn with constant access to pasture in the cooler months and during the night all year long. In the summer, cows are kept in barns with fans and water misters. Glo-Crest feeds their cows locally grown corn silage and alfalfa hay from Kansas. Feed troughs are located both in the barn and under a shaded area next to the parlor. Ensuring the cows’ comfort and milk quality are of upmost importance to the Glovers. The Glovers employ one milker who has been with them for over eight years. 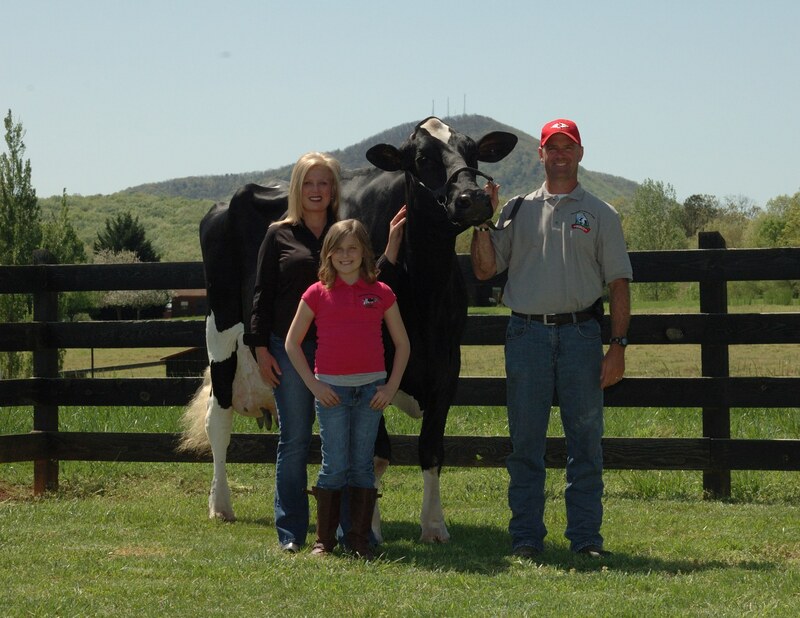 Scott and Jennifer effectively apply their dairy knowledge and hands-on approach to dairy farming, as shown in the herd’s 24,000 Rolling Herd Average. Of the herd, 90% are Registered Holsteins carrying the Que Sera Sera prefix. They’ve sold a few of the registered animals to other breeders and the purchasers have seen success in the showing. One Que Sera Sera animal won her Jr. two-year-old class at the competitive Maryland State Fair and went on to place 9th at World Dairy Expo. Their prefix has also found its way to Reserve Grand Champion at the Georgia National Fair. With great anticipation, their daughter Eliza Jane starts her showing career this year. Scott has a passion for cow genetics and mates all his own cattle considering components, productive life, and health traits. Glo-Crest joined Southeast Milk, Inc. as soon as it was possible and Scott remains a vocal advocate for the cooperative. Scott is on the Board of Directors for the Georgia Milk Producers, as well as a member of the Georgia Dairy Youth Foundation, Georgia Holstein Association and Farm Bureau. Jennifer represents Georgia dairy farms on the SUDIA Board of Directors.